1918 was the critical year of battle as the Great War reached its brutal climax. Warfare of an epic scale was fought on the Western Front, where ordinary British soldiers faced the final test of their training, tactics and determination. That they withstood the storm and began an astonishing counterattack, is proof that by 1918, the British army was the most effective fighting force in the world. But this ultimate victory came at devastating cost. Using a wealth of previously unpublished material, historian Peter Hart gives a vivid account of this last year of conflict - what it was like to fight on the frontline, through the words of the men who were there. 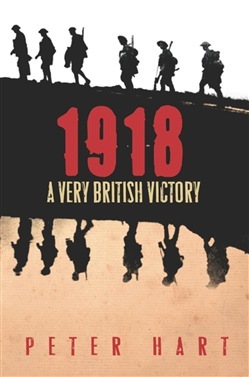 In a chronicle of unparalleled scope and depth, he brings to life the suspense, turmoil and tragedy of 1918's vast offensives. Acquista 1918 in Epub: dopo aver letto l’ebook 1918 di Peter Hart ti invitiamo a lasciarci una Recensione qui sotto: sarà utile agli utenti che non abbiano ancora letto questo libro e che vogliano avere delle opinioni altrui. L’opinione su di un libro è molto soggettiva e per questo leggere eventuali recensioni negative non ci dovrà frenare dall’acquisto, anzi dovrà spingerci ad acquistare il libro in fretta per poter dire la nostra ed eventualmente smentire quanto commentato da altri, contribuendo ad arricchire più possibile i commenti e dare sempre più spunti di confronto al pubblico online.